Students have learned all about pay checks from the Take Charge Today curriculum, specifically the “Getting Paid” resources. If using the locks and boxes version, have all of your materials printed and in the boxes ready to go on the actual breakout day. If using the digital version, have all of your materials printed and ready to go for each team along with your prize box. Create your student teams either randomly or self-generated. Once students are in teams reveal the scenario…Due to a business merger, a new company has taken over payroll. There may have been problems during the conversion and pay checks may not be accurate. 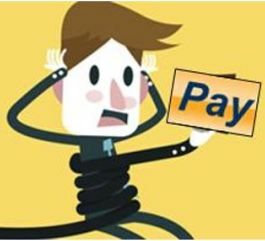 It’s up to you to escape this potential pay check conundrum by completing several challenges. Begin the first challenge. In Challenge #1: Pay Check Lingo, students practice their vocabulary terms which are straight from the Taking Charge Today, Getting Paid resources. My students had been working with these terms via Quizlet Live on an almost daily basis so again, this was just a different way of reviewing them. When teams finish, they must show me their completed challenge and then they receive a clue that will help them figure out the code that will unlock the next challenge (codes are the same for both versions of the breakout). Upon breaking out, students receive their next challenge. In Challenge #2: Calculating Gross Pay, students must use hourly wages to figure out the number of regular and overtime hours worked in order to calculate the gross pay. If calculated correctly, students use the provided clue to figure out the code that opens the next challenge. Challenge #3: Calculating Net Pay has students calculating payroll deductions in order to figure out their net pay. Again, if calculated correctly, along with the clue, students can open up the final challenge. In Challenge #4: Calculating a 401(k) Retirement Plan Contribution, given the percentages, students calculate their contribution for the pay period. The first group to show me the correct calculations or completed Google form, receives the key to the final prize box!